It's always good to have some tunes on tap that sound their best at ear-shattering volumes, and if you're in the market, Nine Inch Nail's "The Day The World Went Away" deserves a spot at the top of the list. Off the "band"'s 1999 classic The Fragile, the perplexingly titled "The Day The Whole World Went Away" is an amazing soundscape complete with walls of distortion that dip in and out for a slick contrast of mellow crooning. 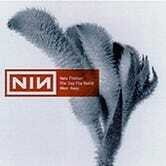 You know, Nine Inch Nails. Though not one of Reznor's most well-known hits (at least not in my experience; a mix of it was in Terminator Salvation apparently), the song boasts one of the better "na na na na na" breaks out there, and can fill a room wonderfully with crashing waves of sound. What I'm saying is that it's good. Just listen.